The One Day Beret pattern is my new favorite pattern for hats. SO easy, so fast, so great to fit over my big curly hair without giving me hat head. It truly is a joyous thing. I’ve already cast on another in Beaverslide Fisherman’s weight, in the prairie aster colorway. I think that one is for a gift. January’s spiral rib STR socks in Spinel have succumbed to Second Sock Syndrome. Ribbing gets old after a while. Ho hum. Yawn. SO, you know, naturally…. I cast on another pair of socks to cure the ennui. Falling In Love socks from MagKnits. 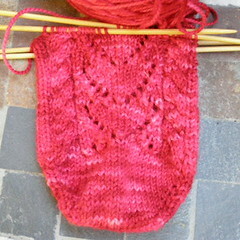 Which pattern I have adapted with a figure 8 cast on, knit on 4 needles rather than 3. Not sure about the heel. I’ll figure it out when I get there. In this case, I may need the extra room from the gusset and flap. Colorway is “Pin Up Girl” which was featured last December in the Tempted Handpainted Yarns sock club. This is the softest, squooshiest yarn ever, not to mention the colorway is PERFECT for little lacy hearts and cables. Yum. My youngest has been kind of sick lately – well, really sick – and she’s missed a LOT of school. So we’re consequently kind of screwed with the school district and they are threatening legal action. I am not sure what to do. I am unbelievably stressed out and the conflict between trying to deal with this AND keep my job is sort of ripping me in two. There really isn’t a solution except to stay the course and try to have as much grace under pressure as I can. So that’s what I’m doing. And knitting. I’m knitting a lot. Because that helps. Ooh, I think I have just the right amount of brown Beaverslide Fisherman’s weight leftover from my Mrs. Darcy Cardigan. 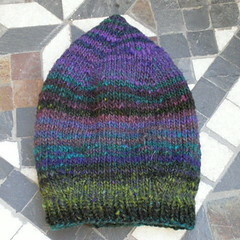 I was thinking a hat anyway, and boy do I love slouchy berets! The Noro one looks awesome. Good luck with the stressful stuff…I’m sure it will work itself out. Not only does knitting help, it means you are armed at all times with pointy objects. But seriously, folks, when our son first went to school, we got the truancy letter just from absences due to colds! Crazy! Apparently they are obligated to send that scary mail out, but it was pretty stressful to open anyway. You would think a doctor’s note would cure that problem. I think Alwen’s right, though, it’s probably mindless bureaucratic form generation. I’ve never heard of that (I’m Canadian). Threatening the parent of a sick kid for being absent? Then again, I think Canada ditched the truancy laws years ago. I hope thinks work out. Just hold your ground and be politely pigheaded. LOVE the “pinup girl” colourway. I’m not usually a “pink” person, but that’s my kind of pink–verging on red. I copied that “Falling in Love” pattern a while ago, and it’s nice to see it knitted up by someone else. My feet have narrow heels (and are wide at the front–duck feet). I find the flap heel fits find–no complaints–but I’ll try the short-row heel you use next time.